Cambridge University Hospitals are well sign posted from most parts of Cambridge. If you are driving from outside Cambridge, there is easy access to the campus via Addenbrooke's Road, signed from Junction 11 on the M11. Use of this road is restricted to those with legitimate business on campus. The post code for a Sat Nav is CB2 0QQ. Cambridge University Hospitals have direct links with most of the Cambridgeshire Park and Ride sites. This is a good option for those travelling by car and if your visit is going to last more than two hours. 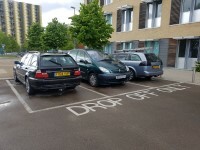 Cambridge University Hospitals has 2 main car parks for patients and visitors. 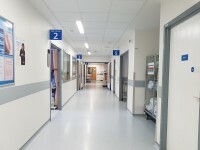 Car park 1 has 750 patient and visitors spaces including 63 disabled spaces. 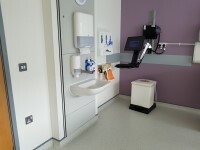 Car park 2 has 600 patient and visitors space including 63 disabled spaces. 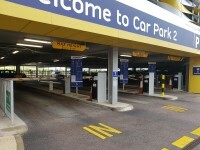 All car parks are barrier operated on the entrances and exits. Parking is ‘Pay on Foot’. Pay on foot means you pay when you are ready to leave, not in advance, you pay for the actual time parked. For Outpatients appointments Clinics 1-19, please park in car park 1. 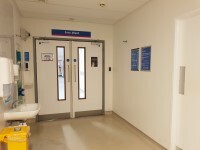 For the emergency department there are 5 reserved 30 minute dropping and collecting bays outside the entrance, then park in car park 1. For Addenbrooke's Treatment Centre (ATC) clinics 30 to 33 and Day Surgery, please park in car park 2. 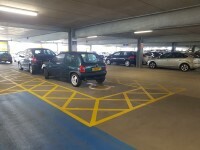 For Rosie Hospital and clinics 20-24 please park in car park 2. 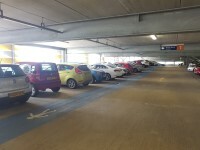 For Blue Badge holders designated spaces are found across the campus and within car parks 1 & 2. Visitors parking is located in either car park 1 or 2. Nearly 60 buses an hour serve Addenbrooke's Hospital on weekdays from both within the City of Cambridge and beyond. The site is also well served at weekends, though buses are less frequent outside of working hours. The hospital has its own bus station at the Hills Road entrance to the site. The majority of buses pick up and drop off here. Cambridge Railway Station is well served by trains from a wide area and is about two miles from Cambridge University Hospitals. 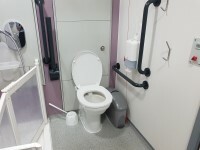 There are good options to get to Cambridge University Hospitals from the station. To get a bus turn left out of the station and bus stops for the campus are about 100m on the left. There are frequent buses and you can take a Guided Bus, a Green Park & Ride bus or a regular bus to Addenbrooke's. Tickets can be bought on the bus. If you buy a PlusBus train ticket this will also cover your bus travel to and from Campus and is a good deal. You can walk or cycle to Cambridge University Hospitals either by following the path besides the Guided Busway or along Hills Road. Please click on the link below for more information on bus timetables. Please click on the link below for more information on train times. 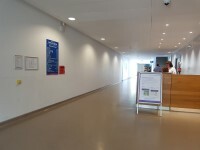 The Patient Advice and Liaison Service (PALS) is located off the corridor, to the left as you enter. 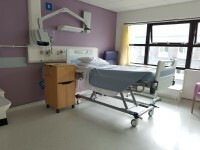 The telephone number for the Patient Advice and Liaison Service (PALS) is 01223 216 756. The email address for the Patient Advice and Liaison Service (PALS) is pals@addenbrookes.nhs.uk. 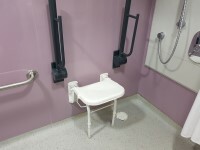 To obtain mobility aids please contact the main reception of each building. 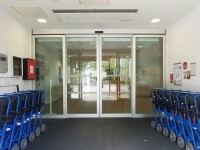 Mobility aids are located at all major entrances. Please note that the street level floor of all the hospitals are called 'Level 2'. You are on Hospital Parking (Drop-Off Point). Skip to the next section. The hospital does not have a dedicated car park. The drop-off point is located in front of the Rosie Hospital Main Entrance. You are on Hospital Parking (Multi-Story Car Park 2). Skip to the next section. 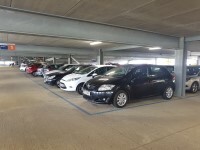 The car park is located at the rear of Addenbrookes Hospital site opposite the entrance to Papworth Hospital Main Entrance. The maximum height is 2.1cm (1in). There is a touchscreen at the barrier. 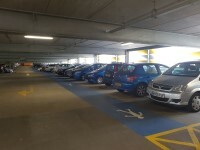 There is/are 62 designated Blue Badge parking bay(s) within the hospital car park. 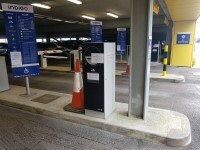 The dimensions of the designated Blue Badge parking bay(s) surveyed are 312cm x 448cm (10ft 3in x 14ft 8in). Payment signs are located at the entrance to the car park. Payment machines are located in the atrium. You are on Getting To (Sara Ward). Skip to the next section. 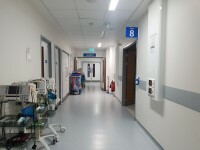 Sara Ward is/are located on level 3 of the Rosie Hospital. 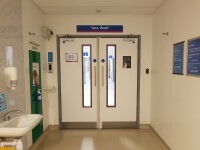 Access to Sara Ward is via the Rosie Hospital Main Entrance. 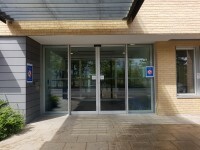 Enter via the Rosie Hospital Main Entrance; the main reception is located on the right. 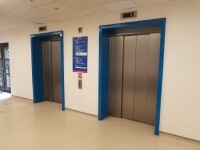 Proceed to the end of the corridor and take the lift located on the left up to level 3. On exiting the lifts turn right and continue down the corridor, Sara Ward is located on the left. There is step free access, via lift, to Sara Ward. Sara Ward is approximately 9m from the Rosie Hospital main lifts. 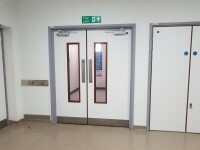 There is a/are manual, heavy, double door(s) between the Rosie Hospital Main Entrance and the department/service. You are on Outside Access (Rosie Hospital Main Entrance). Skip to the next section. This information is for the entrance located at the rear of the hospital site on Robinson Way. The width of the door opening is 194cm. The width of the door opening is 192cm. You are on Other Floors (Stairwell). Skip to the next section. 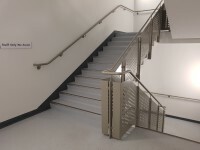 The floors which are accessible by stairs are 1,2,3. You are on Lift (Corridor). Skip to the next section. 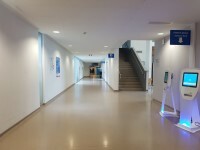 The lift is located at the end of the main corridor. 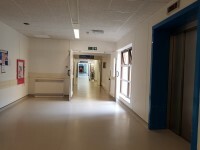 The lift is approximately 32m (34yd 2ft) from the Rosie Main Hospital Entrance. 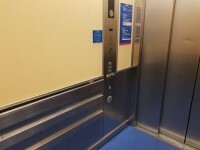 The floors which are accessible by this lift are 1,2,3. The dimensions of the lift are 139cm x 270cm (4ft 7in x 8ft 10in). 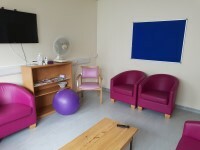 This is a/an Antenatal ward. 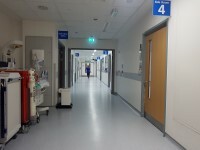 This is a female ward. There is/are 17 bed(s) on this ward in total. 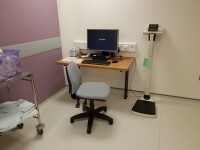 The height of the Nurses' Station desk is 112cm. 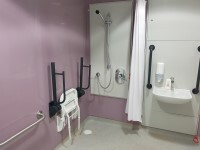 There is an accessible washroom with wheel in showers for patients on the ward. 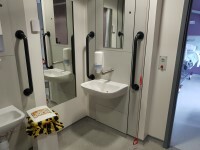 Accessible toilet facilities for visitors are located on level 2 next to the main lifts and stairs. 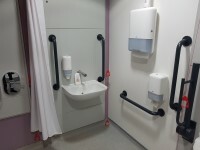 Standard toilet facilities for visitors are located just outside the Sara Ward entrance. The name / number of the room surveyed was; Consulting Room. 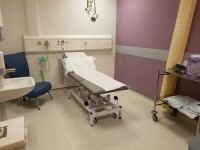 The consultation / treatment room is approximately 12m from the Sara Ward entrance. 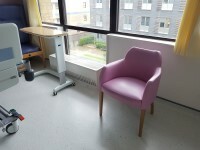 You are on Room / Area (C Section Lounge). Skip to the next section. 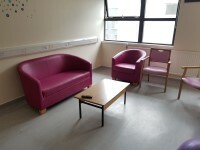 The name / number of the room / area surveyed was; C Section Lounge. 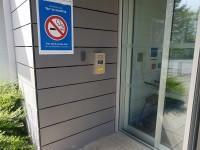 The room / area is approximately 6m from the Sara Ward entrance. You are on Washroom (Ensuite). Skip to the next section. 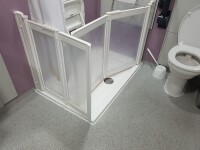 The dimensions of the washroom are 233cm x 247cm (7ft 8in x 8ft 1in). There are coat hooks at 114cm and 146cm from the floor. The lateral transfer space is 164cm. 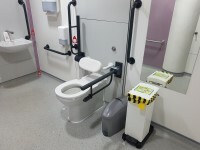 The height of the toilet roll holder is 88cm. 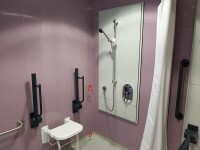 The dimensions of the washroom are 198cm x 329cm (6ft 6in x 10ft 10in). There are coat hooks at 146cm and 114cm from the floor. The tap type is sensor. It is not a mixer tap. 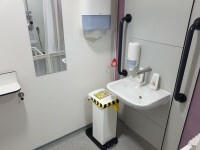 The height of the towel dispenser is 130cm. The lateral transfer space on the left is 141cm. The lateral transfer space on the right is 150cm. 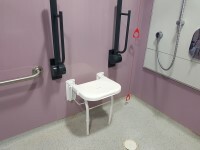 The height of the toilet roll holder is 79cm. 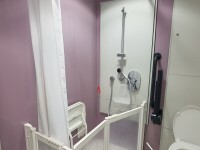 The dimensions of the washroom are 236cm x 172cm (7ft 9in x 5ft 8in). There are coat hooks at 146cm and 113cm from the floor. There is a dropdown rail. 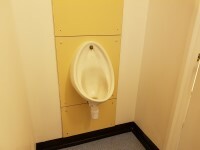 You are on Standard Toilet(s) (Visitors Toilets). Skip to the next section. 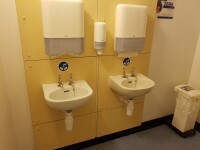 The female and male toilet facilities that were surveyed are located just outside Sara Ward. 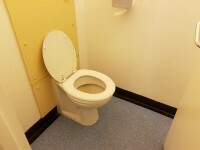 The female and male toilets are approximately 3m (3yd 10in) from the Sara Ward entrance. 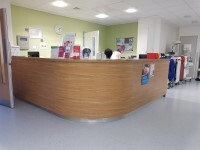 Addenbrooke’s Main Hospital Entrance link (new tab) - click here. 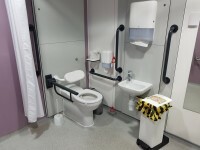 Addenbrooke’s Hospital Multi-Story Car Park 2 link (new tab) - click here. Rosie Hospital Main Entrance link (new tab) - click here.